Back when I was new mom and hell-bent on raising the perfect child, there wasn’t a class, book or toy I wouldn’t try. Today I look back at my antics and laugh. Baby Einstein? Really, what was I thinking? I could avoided these missteps had Retro Baby: Cut Back on All the Gear and Boost Your Baby’s Development With More Than 100 Time-Tested Activities been available then. The new book published by the American Academy of Pediatrics (AAP) advising parents to dump the gadgets and bond the old-fashioned way by going back to the basics. 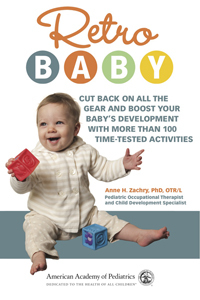 Written by Anne Zachry, PhD, OTR/L, a leading pediatric occupational therapist and child development specialist, the book emphasizes the importance of one-on-one play with children during the early stages of life. Incorporating the latest recommendations from the AAP with extensive research by Zachry and other experts in her field, Retro Baby covers how an infant’s brain, body, motor and sensory skills develop, explain the negative impacts of overusing certain baby gear, and provide specific instructions for play positions and activities that are appropriate for each developmental stage, giving parents both a starting point and guidelines to help them properly invest in their child’s development and future. Learn how crucial connections are formed between a child’s brain and muscles during the first year of life. Discover how the over use of some products can hinder infant exploration. Observe how good old-fashioned play affects your baby’s development in a positive way. Try a variety of ideas that enhance baby’s ability to learn. See how to make traditional, handmade toys using common household items. Retro Baby is currently available for pre-order through Amazon and Barnes and Noble.com, and will be available this fall at bookstores nationwide. For the author’s “Pediatric Occupational Therapy Tips go to (www.drzachryspedsottips.blogspot.com).